Last year we reported confirmation of New Zealand Mud Snails in the Pere Marquette River. We now have the unfortunate responsibility to inform you that they have also been confirmed in the Au Sable River watershed. 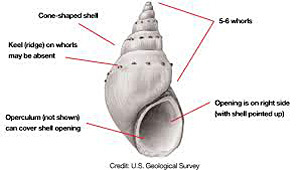 Dr. Mark Luttenton of Grand Valley State University discovered the snails during benthic sampling, and on June 6, 2016 a regional EPA lab confirmed that the snails discovered were indeed New Zealand Mud Snails. Representatives from the Mason Griffith's Chapter of TU and Anglers of the Au Sable are assisting Dr. Luttenton in immediately conducting additional sampling to determine if mud snails are found in any other nearby locations in the upper Au Sable River system. Response coordination has already begun, between TU (state and local chapters), Anglers of the Au Sable, GVSU, MSU, other local entities, and the DNR and DEQ staff. We will all be making efforts to communicate broadly about this finding, to ensure word of it reaches as many anglers of the area as possible, before this impending mayfly hatch season. We will appreciate your help in forwarding the message along to everyone you know who fishes this area. Efforts are also underway to develop and install proper signage, and to coordinate extensive monitoring and assessment of Mudsnails throughout the watershed, as well as other nearby rivers like the Upper Manistee. We will continue to provide updates to you as the response progresses. However, as mentioned in our MICHIGAN TROUT magazine article on New Zealand Mudsnails, (Winter 2016, page 6), Michigan Trout Winter 2016, there are currently no viable eradication means available. The only measure we all have now, to protect this watershed from their spread, is to commit to a regime of decontaminating our waders, boats and gear, to slow their spread. The article referenced above provides greater detail on the Mudsnail and strategies for cleaning our gear effectively, we encourage you to read it as a starting resource (if you haven't already!). Careful, diligent, and effective gear decontamination is critical to slow the spread of Mudsnails; and that's true wherever you fish. We do not have assessments of their presence completed for most of the rivers in the state currently. Where you fish, may very likely have them, and you should begin taking care of gear decontamination as though it does. However, we also recognize that thousands of anglers are about to descend upon the Grayling area as the famous brown drakes and then hexagenia hatches are about to begin. Given this, and the fact that the East Branch of the Au Sable from the hatchery downstream to the confluence with the mainstem is confirmed infected, we encourage anglers and others to avoid fishing and wading in this particular section of river for now. 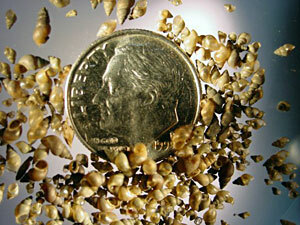 New Zealand Mud snails are small, up to 1/8" in length (up to 50 can fit on the face of a dime). They range from light brown to black in color; have 5-6 whorls, of gradually increasing size from one end to the other, and are right-handed snails (meaning when held with the small tip upward, the opening should face you to your right side). They reproduce prolifically and can reproduce asexually meaning a single specimen can result in thousands of offspring.